Spin and orbital angular momenta (AM) of light are well studied for free-space electromagnetic fields, even nonparaxial. One of the important applications of these concepts is the information transfer using AM modes, often via optical fibers and other guiding systems. However, the self-consistent description of the spin and orbital AM of light in optical media (including dispersive and metallic cases) was provided only recently [Bliokh et al., Phys. Rev. Lett. 119, 073901 (2017) [CrossRef] ]. Here we present the first accurate calculations, both analytical and numerical, of the spin and orbital AM, as well as the helicity and other properties, for the full-vector eigenmodes of cylindrical dielectric and metallic (nanowire) waveguides. We find remarkable fundamental relations, such as the quantization of the canonical total AM of cylindrical guided modes in the general nonparaxial case. This quantization, as well as the noninteger values of the spin and orbital AM, are determined by the generalized geometric and dynamical phases in the mode fields. Moreover, we show that the spin AM of metallic-wire modes is determined, in the geometrical-optics approximation, by the transverse spin of surface plasmon polaritons propagating along helical trajectories on the wire surface. Our work provides a solid platform for future studies and applications of the AM and helicity properties of guided optical and plasmonic waves. L. Allen, S. M. Barnett, and M. J. Padgett, Optical Angular Momentum (IOP, 2003). J. P. Torres and L. Torner, Twisted Photons: Applications of Light with Orbital Angular Momentum (Wiley-VCH, 2011). D. L. Andrews and M. Babiker, The Angular Momentum of Light (Cambridge University, 2012). L. Allen, M. Padgett, and M. Babiker, “The orbital angular momentum of light,” Prog. Opt. 39, 291–372 (1999). A. M. Yao and M. J. Padgett, “Orbital angular momentum: origins, behavior and applications,” Adv. Opt. Photon. 3, 161–204 (2011). K. Y. Bliokh and F. Nori, “Transverse and longitudinal angular momenta of light,” Phys. Rep. 592, 1–38 (2015). V. B. Berestetskii, E. M. Lifshitz, and L. P. Pitaevskii, Quantum Electrodynamics (Butterworth-Heinemann, 1982). D. E. Soper, Classical Field Theory (Wiley, 1976). E. Leader, “The photon angular momentum controversy: resolution of a conflict between laser optics and particle physics,” Phys. Lett. B 756, 303–308 (2016). S. Van Enk and G. Nienhuis, “Commutation rules and eigenvalues of spin and orbital angular momentum of radiation fields,” J. Mod. Opt. 41, 963–977 (1994). K. Y. Bliokh, M. A. Alonso, E. A. Ostrovskaya, and A. Aiello, “Angular momenta and spin-orbit interaction of nonparaxial light in free space,” Phys. Rev. A 82, 063825 (2010). S. M. Barnett, “Rotation of electromagnetic fields and the nature of optical angular momentum,” J. Mod. Opt. 57, 1339–1343 (2010). I. Bialynicki-Birula and Z. Bialynicka-Birula, “Canonical separation of angular momentum of light into its orbital and spin parts,” J. Opt. 13, 064014 (2011). K. Y. Bliokh, J. Dressel, and F. Nori, “Conservation of the spin and orbital angular momenta in electromagnetism,” New J. Phys. 16, 093037 (2014). H. He, M. Friese, N. Heckenberg, and H. Rubinsztein-Dunlop, “Direct observation of transfer of angular momentum to absorptive particles from a laser beam with a phase singularity,” Phys. Rev. Lett. 75, 826–829 (1995). K. Gahagan and G. Swartzlander, “Optical vortex trapping of particles,” Opt. Lett. 21, 827–829 (1996). V. Garcés-Chávez, D. McGloin, M. Padgett, W. Dultz, H. Schmitzer, and K. Dholakia, “Observation of the transfer of the local angular momentum density of a multiringed light beam to an optically trapped particle,” Phys. Rev. Lett. 91, 093602 (2003). J. Leach, B. Jack, J. Romero, A. K. Jha, A. M. Yao, S. Franke-Arnold, D. G. Ireland, R. W. Boyd, S. M. Barnett, and M. J. Padgett, “Quantum correlations in optical angle-orbital angular momentum variables,” Science 329, 662–665 (2010). G. Gibson, J. Courtial, M. J. Padgett, M. Vasnetsov, V. Pas’ko, S. M. Barnett, and S. Franke-Arnold, “Free-space information transfer using light beams carrying orbital angular momentum,” Opt. Express 12, 5448–5456 (2004). J. Wang, J.-Y. Yang, I. M. Fazal, N. Ahmed, Y. Yan, H. Huang, Y. Ren, Y. Yue, S. Dolinar, M. Tur, and A. E. Willner, “Terabit free-space data transmission employing orbital angular momentum multiplexing,” Nat. Photonics 6, 488–496 (2012). F. Tamburini, E. Mari, A. Sponselli, B. Thidé, A. Bianchini, and F. Romanato, “Encoding many channels on the same frequency through radio vorticity: first experimental test,” New J. Phys. 14, 033001 (2012). A. W. Snyder and J. Love, Optical Waveguide Theory (Springer, 1983). D. Marcuse, Light Transmission Optics (Van Nostrand Reinhold, 1982). C. Pfeiffer, E. Economou, and K. Ngai, “Surface polaritons in a circularly cylindrical interface: surface plasmons,” Phys. Rev. B 10, 3038–3051 (1974). L. Novotny and C. Hafner, “Light propagation in a cylindrical waveguide with a complex, metallic, dielectric function,” Phys. Rev. E 50, 4094–4106 (1994). A. E. Willner, H. Huang, Y. Yan, Y. Ren, N. Ahmed, G. Xie, C. Bao, L. Li, Y. Cao, Z. Zhao, J. Wang, M. P. J. Lavery, M. Tur, S. Ramachandran, A. F. Molisch, N. Ashrafi, and S. Ashrafi, “Optical communications using orbital angular momentum beams,” Adv. Opt. Photon. 7, 66–106 (2015). A. Dooghin, N. Kundikova, V. Liberman, and B. Y. Zel’dovich, “Optical magnus effect,” Phys. Rev. A 45, 8204–8208 (1992). V. Liberman and B. Zel’dovich, “Spin-orbit interaction of a photon in an inhomogeneous medium,” Phys. Rev. A 46, 5199–5207 (1992). K. Y. Bliokh and Y. P. Bliokh, “Modified geometrical optics of a smoothly inhomogeneous isotropic medium: the anisotropy, berry phase, and the optical magnus effect,” Phys. Rev. E 70, 026605 (2004). C. N. Alexeyev, A. Volyar, and M. A. Yavorsky, “Fiber optical vortices,” in Lasers, Optics and Electro-Optics Research Trends, L. I. Chen, ed. (Nova, 2007), pp. 131–223. S. Golowich, “Asymptotic theory of strong spin-orbit coupling in optical fiber,” Opt. Lett. 39, 92–95 (2014). K. Y. Bliokh, F. Rodrguez-Fortuño, F. Nori, and A. V. Zayats, “Spin-orbit interactions of light,” Nat. 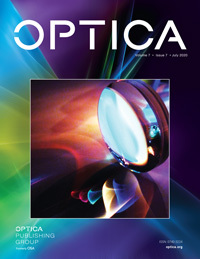 Photonics 9, 796–808 (2015). A. Alexeyev, T. Fadeyeva, A. Volyar, and M. Soskin, “Optical vortices and the flow of their angular momentum in a multimode fiber,” Semicond. Phys. Quantum Electron. Optoelectron. 1, 82–89 (1998). F. Le Kien, V. Balykin, and K. Hakuta, “Angular momentum of light in an optical nanofiber,” Phys. Rev. A 73, 053823 (2006). I. Brevik, “Experiments in phenomenological electrodynamics and the electromagnetic energy-momentum tensor,” Phys. Rep. 52, 133–201 (1979). R. N. Pfeifer, T. A. Nieminen, N. R. Heckenberg, and H. Rubinsztein-Dunlop, “Colloquium: momentum of an electromagnetic wave in dielectric media,” Rev. Mod. Phys. 79, 1197–1216 (2007). S. M. Barnett and R. Loudon, “The enigma of optical momentum in a medium,” Philos. Trans. R. Soc. A 368, 927–939 (2010). P. W. Milonni and R. W. Boyd, “Momentum of light in a dielectric medium,” Adv. Opt. Photon. 2, 519–553 (2010). B. Kemp, “Resolution of the Abraham-Minkowski debate: implications for the electromagnetic wave theory of light in matter,” J. Appl. Phys. 109, 111101 (2011). K. Y. Bliokh, A. Y. Bekshaev, and F. Nori, “Optical momentum, spin, and angular momentum in dispersive media,” Phys. Rev. Lett. 119, 073901 (2017). K. Y. Bliokh, A. Y. Bekshaev, and F. Nori, “Optical momentum and angular momentum in complex media: from the Abraham-Minkowski debate to unusual properties of surface plasmon-polaritons,” New J. Phys. 19, 123014 (2017). J. D. Jackson, Classical Electrodynamics (Wiley, 1999). L. D. Landau, E. M. Lifshitz, and L. P. Pitaevskii, Electrodynamics of Continuous Media (Pergamon, 1984). K. Y. Bliokh and F. Nori, “Transverse spin of a surface polariton,” Phys. Rev. A 85, 061801 (2012). A. Aiello, P. Banzer, M. Neugebauer, and G. Leuchs, “From transverse angular momentum to photonic wheels,” Nat. Photonics 9, 789–795 (2015). G. N. Afanasiev and Y. P. Stepanovsky, “The helicity of the free electromagnetic field and its physical meaning,” Il Nuovo Cimento A 109, 271–279 (1996). J. L. Trueba and A. F. Ranada, “The electromagnetic helicity,” Eur. J. Phys. 17, 141–144 (1996). K. Y. Bliokh, A. Y. Bekshaev, and F. Nori, “Dual electromagnetism: helicity, spin, momentum and angular momentum,” New J. Phys. 15, 033026 (2013). I. Fernandez-Corbaton, X. Zambrana-Puyalto, N. Tischler, X. Vidal, M. L. Juan, and G. Molina-Terriza, “Electromagnetic duality symmetry and helicity conservation for the macroscopic Maxwell’s equations,” Phys. Rev. Lett. 111, 060401 (2013). K. van Kruining and J. B. Götte, “The conditions for the preservation of duality symmetry in a linear medium,” J. Opt. 18, 085601 (2016). F. Alpeggiani, K. Bliokh, F. Nori, and L. Kuipers, “Electromagnetic helicity in complex media,” Phys. Rev. Lett. 120, 243605 (2018). M. Partanen, T. Häyrynen, J. Oksanen, and J. Tulkki, “Photon mass drag and the momentum of light in a medium,” Phys. Rev. A 95, 063850 (2017). T. G. Philbin, “Electromagnetic energy momentum in dispersive media,” Phys. Rev. A 83, 013823 (2011). T. G. Philbin and O. Allanson, “Optical angular momentum in dispersive media,” Phys. Rev. A 86, 055802 (2012). K. Y. Bliokh, A. Niv, V. Kleiner, and E. Hasman, “Geometrodynamics of spinning light,” Nat. Photonics 2, 748–753 (2008). L. Novotny and B. Hecht, Principles of Nano-Optics (Cambridge University, 2012). P. B. Catrysse and S. Fan, “Understanding the dispersion of coaxial plasmonic structures through a connection with the planar metal-insulator-metal geometry,” Appl. Phys. Lett. 94, 231111 (2009). D. Garoli, P. Zilio, F. De Angelis, and Y. Gorodetski, “Helicity locking of chiral light emitted from a plasmonic nanotaper,” Nanoscale 9, 6965–6969 (2017). M. V. Berry, “Optical currents,” J. Opt. A 11, 094001 (2009). K. Y. Bliokh, A. Y. Bekshaev, A. G. Kofman, and F. Nori, “Photon trajectories, anomalous velocities and weak measurements: a classical interpretation,” New J. Phys. 15, 073022 (2013). S. M. Barnett and M. Berry, “Superweak momentum transfer near optical vortices,” J. Opt. 15, 125701 (2013). J. F. Nye, “Phase gradient and crystal-like geometry in electromagnetic and elastic wavefields,” in Sir Charles Frank, OBE: An Eightieth Birthday Tribute, R. G. Chambers, J. E. Enderby, A. Keller, A. R. Lang, and J. W. Steeds, eds. (Adam Hilger, 1991), pp. 220–231. M. V. Berry and M. R. Dennis, “Polarization singularities in isotropic random vector waves,” Proc. R. Soc. London A 457, 141–155 (2001). R. Bhandari, “Polarization of light and topological phases,” Phys. Rep. 281, 1–64 (1997). S. A. H. Gangaraj, M. G. Silveirinha, and G. W. Hanson, “Berry phase, Berry connection, and Chern number for a continuum bianisotropic material from a classical electromagnetics perspective,” IEEE J. Multiscale Multiphys. Comput. Tech. 2, 3–17 (2017). G. De Nittis and M. Lein, “The Schrödinger formalism of electromagnetism and other classical waves—how to make quantum-wave analogies rigorous,” Ann. Phys. (2018, in press), doi: 10.1016/j.aop.2018.02.019. K. Y. Bliokh, Y. Gorodetski, V. Kleiner, and E. Hasman, “Coriolis effect in optics: unified geometric phase and spin-Hall effect,” Phys. Rev. Lett. 101, 030404 (2008). J. Nkoma, R. Loudon, and D. Tilley, “Elementary properties of surface polaritons,” J. Phys. C 7, 3547–3559 (1974). F. L. Kien, T. Busch, V. G. Truong, and S. N. Chormaic, “Higher-order modes of vacuum-clad ultrathin optical fibers,” Phys. Rev. A 96, 023835 (2017). M. Partanen and J. Tulkki, “Angular momentum and field quantization in nondispersive media,” arXiv:1803.10069 (2018). Fig. 1. Schematic pictures of the eigenmodes of (a) a dielectric fiber and (b) a metallic wire. The geometrical-optics skew rays with their polarizations (transverse circular in dielectrics and in-plane elliptical for surface plasmon polaritons [6,36,49,50]) are shown by cyan and magenta, respectively. These helical rays and their corresponding polarizations illustrate the origin of the orbital (L) and spin (S) AM of the cylindrical guided modes. Fig. 2. Numerically calculated eigenmodes (a) of a multimode dielectric fiber with parameters r0=200 nm, ϵ1=2.1, and ϵ2=1 and (b) of a metallic wire with parameters r0=150 nm, ϵ1=1−ωp2/ω2, ωp=1.3262×1016 s−1≃6.63c/r0, ϵ2=1. The frequency ω was varied in these calculations [note that varying the radius r0 would result in different curves in the panels (b)]. The upper panels depict the normalized propagation constants β, which characterize the canonical momentum (9) of the modes (exceeding ℏk0 per photon). The lower panels show the subluminal group velocities (9) of the modes. The small greyscale panels show typical transverse energy distributions W(x,y) in different modes. The dielectric fiber modes are marked by the total-AM quantum number ℓ=m+σ, as well as by the three (orbital, spin, and radial) quantum numbers (m,σ,n) in Eq. (8). The metallic-wire modes are marked by the single total-AM quantum number ℓ. The dotted curves in (b) correspond to the surface-plasmon geometrical-optics model [Eqs. (21) and (22)]. Fig. 3. Numerically calculated canonical spin, orbital, and total AM [Eqs. (1), (10), (11), and (17)] as well as the helicity [Eqs. (4) and (17)] and the Abraham–Poynting total AM [Eq. (3)] of the modes of a dielectric fiber are shown in Fig. 2(a). Here, plotted are the normalized integral values (in units of ℏ per photon), defined as …¯=ω⟨…⟩/⟨W⟩. One can see the quantization of the canonical total AM J¯z=L¯z+S¯z=ℓ, the noninteger Poynting–Abraham AM J¯z≠ℓ, and the differing spin AM and helicity S¯z≠S¯. In the large-radius (paraxial) limit k0r0≫1, the canonical spin and orbital AM tend to the quantized values L¯z≃m and S¯z≃S¯≃σ. Fig. 4. Same as in Fig. 3 but for the metallic-wire modes shown in Fig. 2(b). The parameters are the same as in Fig. 2(b), and the frequency ω was varied in these plots (varying the radius r0 would result in different curves). The main difference in the behavior of the depicted quantities as compared to Fig. 3 is that in the large-radius (paraxial) limit k0r0≫1, the canonical spin and orbital AM tend to the values L¯z≃ℓ and S¯z≃S¯≃0, whereas, surprisingly, the Poynting–Abraham total AM also vanishes: J¯z≃0. The red dotted curves correspond to the geometrical-optics model for the spin AM [Eq. (23)], based on the transverse spin of surface plasmon polaritons.